I spent the first part of Thanksgiving with my husband's family at his aunt and uncle's house. They present a very beautiful and bountiful table. The food kept coming and coming and coming! 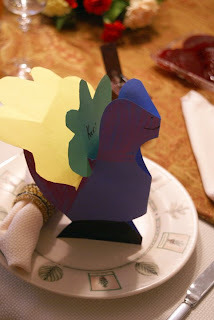 The children in the family make the place cards for the table. This is mine. It's so cute! 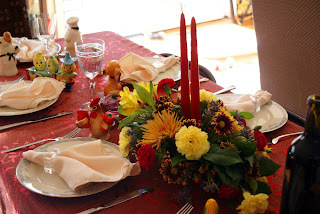 My family is much less formal with Thanksgiving (still fun though), but it was nice to have such details on the table. By FAR my favorite piece of the table was the salt and pepper shakers. Each person gets his or her own salt and pepper shaker - some 100 years old! This was mine. The little sewing machine drawers come out and hold the salt and pepper. Who even knew such a salt and pepper shaker existed! I wanted to take it home with me! 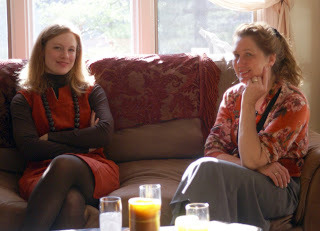 This is me with my lovely mother-in-law who is visiting from Virginia for the week. More to come! I love your red dress, very cute! We're pretty formal in my household, but I sure do like the looks of a beautifully set table. I adore the idea of individual salt and pepper shakers. And who knew there was a sewing machine version! I LOVE those s&p shakers! The table sure is pretty. You look so pretty in the last picture, and your M-I-l=L looks so young. Glad you had a wonderful time. i love the place cards! and everything else. 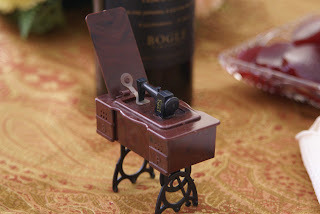 What a neat idea the salt & pepper shakers! Is this like a family tradition that continues each year where you get to take them home? How cool!